The Chief Information Commissioner and two State Information Commissioners were formally appointed today by administering them oath of affirmation. 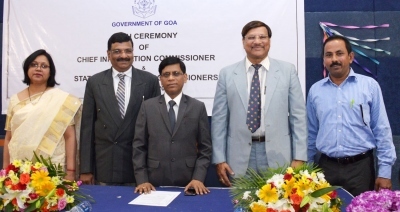 Adv Prashant Tendolkar as the CIC and Pratima Vernekar and Juino D’Souza as SICs were administered the oath of office by Goa Chief Secretary R K Srivastava. As per the provisions of the Right to Information Act, the CS was appointed by Governor Mridula Sinha to administer the oath. The function held at the Secretariat seminar hall was attended by several other senior officials as well as the friends and family members of the new appointees. The appointments gain significance in the background of keeping the Information Commission’s office vacant for over a year, after former CIC Leena Mehendle vacated her post at the age of 65. On the other hand, the appointment of SICs was kept hanging for over three years by selecting and scrapping the posts on four occasions, citing several legal anomalies. Even now, the three learned people were selected in October while they have been actually authorised to function only after three months. Meanwhile, thousands of applications have piled up before the Information Commission while the whole process of transparency in the administration has come to a grinding halt. It needs to be seen whether Goa government will make the Commission office functional as Mehendle always cried for want of enough staff and a full-time secretary throughout her tenure.